A carport is a structure that offers limited protection to vehicles, primarily cars, from the elements. The structure can either be freestanding or attached to a wall. Unlike most structures, they do not have four walls, and are most commonly found with only two walls. They offer less protection than garages, but allow for more ventilation. The term carport was coined by renowned architect Frank Lloyd Wright, when he began using them in some of his home designs. Wright described the structure as a cheap and effective device for the protection of a car. 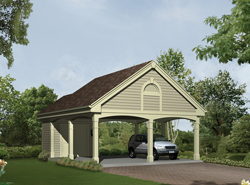 Browse our collection of carport plans to find the perfect carport design for you. 575 Sq. Ft., Width 26'-0", Depth 24'-0"
396 Sq. Ft., Width 22'-0", Depth 40'-0"
Our collection of project plans includes many styles and sizes of carport plans perfect for your building needs. We offer detailed blueprints that easily allow the do-it-yourselfer to visualize the look of the entire finished project, down to the smallest detail. With a wide variety of carport plans, we are sure that you will find the perfect do-it-yourself project to fit your needs and lifestyle.